Experience MWENDO DAWA! Jazz - freeform - fusion - avant garde - electro acoustic music or just MWENDO DAWA! The group from the start led and developed by Susanna Lindeborg and Ove Johansson is not only fronting these two musicians but also consists of four very strong personalities and four utterly skillful musicians and improvisers. To be able to completely understand and comprehend the music of Mwendo Dawa you should have to listen to the whole catalogue of the group from the late 70th until today with a very modern sound and searching for new forms and expression. All the time with the acoustic instruments in focus but with the developement of electronic instruments and later on computers as a basis for musical expression. But it is not necessary to follow the whole musical trip - you can just accept the music and give yourself time to listen! 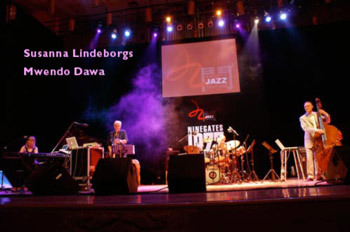 SUSANNA LINDEBORG´S MWENDO DAWA is always an adventure listening to. They were a bit of pioneers when the group was formed in the 70th when it came to combining expression of Jazz and traditional instruments together with the possibilities given by new instruments of the time. And they still are. Mwendo Dawa has also during the years been a nursery for several well known Swedish musicians like bass players Anders Jormin and Lars Danielsson and guitar player Ulf Wakenius. Musically MWENDO DAWA is now working with improvisation in serial technique with electro acoustical backgrounds but with a strong rythmical approach. The group is still now as much pioneers as ever before. MWENDO DAWA is updated on all frontiers, the musical vision is still there but has changed and grown not only together with technological progress. The question rises if not MWENDO DAWA is better than ever before. "A taste of four free minds"
SUSANNA LINDEBORG started as a classical pianist before she got into improvised music. She began working as a professional jazzmusician during the late seventies and then added synthesizer to her keyboard work. Today you can also hear her in the LINDEBORG/JOHANSSON DUO and she is also performing solo doing a improvisational performance together with her computers doing electroacoustical backgrounds. Her first soloCD came1989, and this record gave her some recognition and led to work in Germany together with other European and American musicians and radio and TV performances. Susanna's style is powerful and she uses the electronical keyboards very tastefully and is careful with æsthetic form. Her third solo came 2010 called "Excursions". 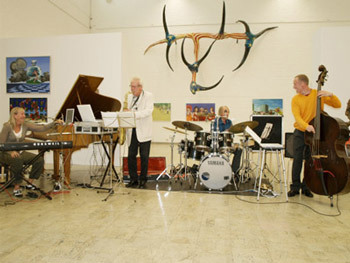 Four duoCDs together with Ove Johansson are released - the latest "Thoughtful World" 2010. And with the group NATURAL ARTEFACTS together with PA Nilsson, computer, presenting Live electronics, came two CD releases. Susanna's style is powerful and she uses piano and electronical keyboards very tastefully. 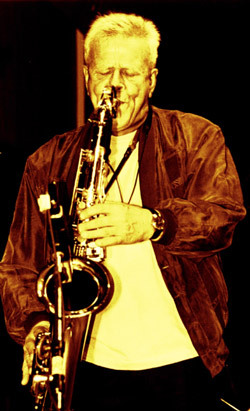 OVE JOHANSSON tenorsax, EWI has since the end of the fifties been leading his own groups and been a driving force of the Swedish jazz scene, he is also musical director of MWENDO DAWA. Although he has been very active on the Swedish jazz scene since several years his most rewarding efforts has been with MWENDO DAWA. Ove Johansson's musical work stretches all the way from straight ahead, free form and electronic jazz to the acoustic and electroacoustical mix of today. With MWENDO DAWA he has been able to present his music throughout the world- both in Europe and North and South America, and he has produced 32 albums with his own material and with the group. You can also listen to his five solo releases - his most recent is “Coast” from 2010. 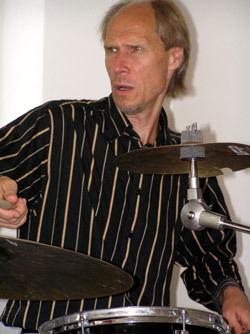 The style of Ove Johansson has always been very personal with a powerful and intense performance and a sound and technique you seldom hear in Europe. Contrary to a lot of other players, he has not got caught in the style he began to play in, but has during the years all the time been renewing his own playing and musical expression as well as MWENDO DAWA´s. He is always in the frontline according to new music. Since 1989 he has his own record label LJ Records to present his own and new Scandinavian jazz music internationally. JIMMI ROGER PEDERSEN (1965), Danish double bass player and composer, born and raised in Copenhagen. After a short time at Rhythmic Music Conservatory JRP began to work as a professional musician: First in an intense period of engagements in the Copenhagen jazz and club scene, then as a house bass player at ”Dennis Swing Club ” in Hamburg as well as club, studio and festival gigs i Europe plus solo playing. Been touring a lot both as a accompanist and a member of different groups internationally and recorded radio and television broadcasts plus music documentary film. 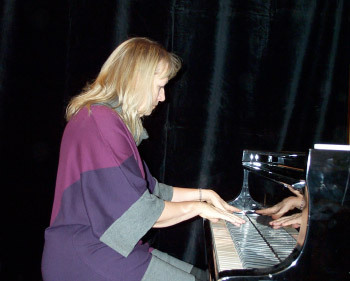 As the duo with pianist Horace Parlan for more than 10 years. Today living in the country near Copenhagen. JRP has his own label and released two solo bass CD s consisting of all original music. Besides concert activity is the Danish bass tradition also carried on by the teaching. 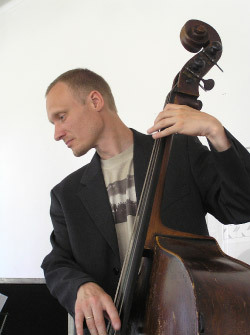 JRP also made his own publishing and released 4 booklets in the series ”Scandinavian Double Bass Technique ”.This school of bass explains and develops a technique that highly bears the impress of the deceased NHØP. control to completely free playing. He has been a member of Mwendo Dawa for a long time and has been touring internationally with the group and been very much contributing to the special sound of Mwendo Dawa. He came in his early 20th to Sweden, made his studies in Gothenburg and has since then played with a lot of both Swedish and Norwegian groups and musicians. He has been active in Norway playing at many of their Jazz festivals and performed with musicians like Philippe Catherine and George Garzone. He has also a dramatic side and is doing solo performances where his lively expression is deeply appreciated.